Here is the dinner plate and soup bowl of one of my students. 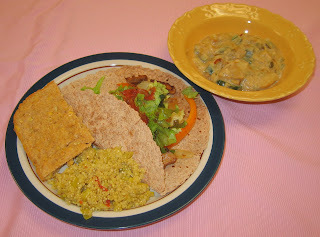 We made quinoa with leeks, guacamole, seitan fajitas, cornbread, potato soup (one team made it fairly thick and the other made it thinner), and orangey rice pudding. Everything turned out well, particularly the cornbread and rice pudding. potatoes that I've ever had. I keep getting amazingly positive feedback from the over 500 attendees of our Thanksgiving last week! and made a sauce including Monterey Farms' "Buffalo" variety of "Artihearts" and half-moon slivers of briefly sauteed onions. I topped it with vegan Parm! "Parmesan cheese". 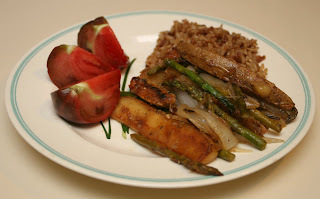 I also served some sauteed tempeh and a salad of tomato and purple pepper. I love Scottish Bute Island Foods' "sheese" - my favorite "cheese" (vegan, of course) and am so glad that Black Duck Imports brings their products to the U.S. I served slices of their gouda-style sheese on top of a toasted wheat English muffin half. We have a good friend who drove from Ohio today to spend a few days with us and enjoy our Thanksgiving. 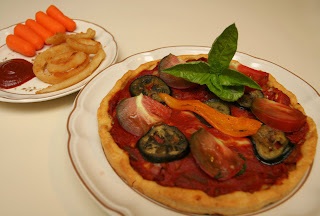 Like I did a couple of weeks ago, I used Vicolo Pizza organic cornmeal crust pizza shell to make deep-dish pizza. 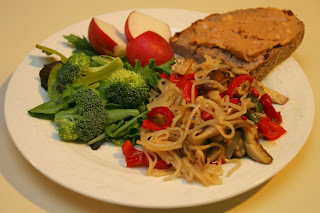 Last week, I came up with the idea of mixing grilled chunks of vegan Field Roast Grain Meat Company apple-sage artisanal sausage into a thick sauce. I did that with two sausages as well as a medium onion that I had cut into half moons, and mixed them into a small 6-ounce can of organic tomato paste and about half of a 24-ounce bottle of Newman's Own Sockarooni Sauce. Raffle prizes are rolling in, and today I received 4 cases of Monterey Farms "Artihearts", a product which I discovered in late September. The kind owner asked me to keep one packet of each flavor to try, and I used about half of a packet of the "Buffalo" variety in the sauce. I also mixed in a little salt and fresh oregano leaves from my garden. On one pizza, I also dabbed on portions of the Scottish cheddar- style cream "sheese". I baked the two pizzas at 425°F for about 15m, turning them halfway through. I put heirloom tomato slices and a dab of pesto on the "sheese"-less pizza before serving it. I also pan-roasted fingerling potatoes with a medium shallot, rosemary, dill weed, salt, and pepper, and served raw purple cauliflower. 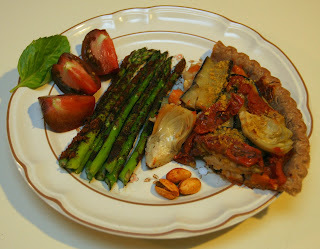 It was a good dinner - the vegan sausage was a nice touch in the pizza. We're glad to have our friend visiting! 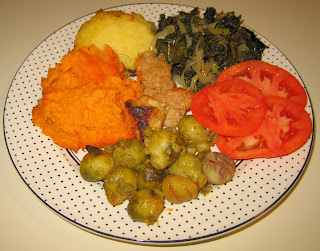 Right after our recent vacation to the US' Southwest, I prepared a very tasty "three sisters" meal using the ancient staples of corn, beans, and squash, and then, two days later, had another try at it. Tonight was my third such meal and turned out to be in the middle of the other two in appeal. I used two interesting ingredients, neither of which I ever remembering having before, dragon tongue bean and dried mulato pepper. Dragon tongue bean pods look pretty, creamy white streaked with purple. They are snap beans similar to green beans but flatter and, I was told, quite enjoyable raw. The purple color fades with heat, but the pods can be steamed, blanched, boiled, or pickled. We enjoyed their mild taste raw, but I will look to buy them again and try cooking them. The mulato pepper is a dried poblano that is dark brown and wrinkled. It is reasonably mild and had such a surprising fruity/chocolatey taste, slightly smoky, that I really liked. I read that it is a key ingredient in mole sauces (I brought a prepared mole sauce back from the vacation and hope to start experimenting with it soon). Anyway, I baked squash (350°F for 35 minutes or so; the bigger squash could have used another 10 minutes or so of baking, but was fine) and stuffed it with mashed potatoes. I served the beans raw and made corn my favorite way by roasting it on an open flame, stripping the kernels, and mixing in salt, Earth Balance margarine, and lime juice. I also coarsely chopped a medium mulato pepper and mixed it in; the pepper tasted good and the combination was nice. We both enjoyed the meal! I am very busy this week with getting our Thanksgiving event going - we are full with over 500 people but I have to attend to final raffle, volunteer assignments, wait list (growing each day) management, media relations, etc. tasks. I was working with our amazing webmaster last night till about 3a! Luckily, my wife came home with leftovers from a Sanskrit class that she tried out at somebody's house, and which included dinner. I simply heated the Indian dishes and made some rice noodles and a sandwich. Tomorrow a good friend is driving from Ohio and visiting us so she can attend our Thanksgiving; I have a good dinner planned! I'll probably make a simple and quick meal on the eve of Thanksgiving. I was proud of tonight's dinner - I joined my wife at an Indian cultural program which adjourned for the provided dinner around 9 or 9:30p. We didn't find the food to look so great and were hoping to eat at home, anyway, so I cooked. I was happy that I was able to make pesto from my recently harvested basil and cook dinner, all in just over an hour. This pesto (see my recipe below; I didn't follow it exactly) batch turned out a bit too salty, so I "diluted" it with more toasted pine nuts plus some walnuts and additional oil, but was still good. I sauteed finely cubed tempeh for a few minutes then added less than 1/4 jalapeno, also cubed finely, for a little heat. A minute or two after that, I added a little bit (maybe 2 tablespoons) of 1/4" or so chopped red onion, and just cooked another minute or two to leave the onion still crispy and only partially cooked. I purchased a new (for me) organic brown rice penne pasta by Tinkyada, a Canadian company found at ricepasta.com . Coincidentally, I had purchased it the same day or just shortly before last Saturday's potluck dinner, and the host served this same brand of pasta - I loved it then (and tonight!) for its taste and slight texture. I mixed the tempeh scramble and two tablespoons or so of the pesto into the pasta. We loved it! More than a month ago (! ), the night before we left on our recent Southwest U.S. vacation, we had an extra artichoke leftover. We were full so I tucked it into a container in the refrigerator, thinking it may survive ten days or so for our return. I didn't get to it and was going to compost it today, but was surprised that it seemed fine! So I heated it, halved it, and served it simply without the typical dipping sauce that I prepare, but just with a little Earth Balance margarine spread on top to melt down into the gaps, as well as salt and fresh lime. It was good! I also served leftover panzanella (bread salad) from class Thursday night. Tonight's was my wife and my favorite dinner in some time! Yesterday we also had a good dinner - my Mom and Dad had some of their nice friends over for dinner, and asked us to join them. In addition to my Mom's tasty dishes (e.g., stuffed eggplant, lentil dhal "soup", rice, potatoes), one of her friends brought a delicious spinach-whole wheat poori (fried bread). My wife contributed a dessert; she usually doesn't cook, but experimented a few days ago with an Indian recipe with coconut and dairy - but she used hemp milk. It came out very well, and I helped her to encase it in filo puff pastry and bake it - it was good and not too sweet! By the way, this afternoon we sold out of our Thanksgiving feast with over 500 attendees. It looks like we'll again be the country's largest vegetarian Thanksgiving; we have attendees coming from at least 42 cities in 7 states. We've had good mentions in numerous places so far this year, including a number of local papers (e.g., the November 15 Carrboro-Citizen, November 14 Raleigh News and Observer, November 10 Durham News (story Have a very vegetarian holiday), and November 7 Independent) as well as many online sources. Toast 1/4 cup pine nuts in a heavy skillet over medium-low heat, stirring often, till browned (about 3-5 minutes); alternatively, skip the pine nuts and use, untoasted, 1/4 cup walnuts. Put the basil and nuts into a food processor. Also add 3-4 cloves of garlic, 6T (just shy of 1/2 cup; 1c=16T) extra virgin olive oil, 1/2 t salt, and optionally 1T nutritional yeast. You can also add in a few tablespoons of sundried tomato, 1/2 t coarse ground black pepper, and, if you want a bit of an onion flavor, 1 scallion. Puree until smooth or the consistency you desire. The end result will be grainy; if you are aiming for a more traditional "runny" pesto sauce, use almost 3/4 cup or even more olive oil, as you prefer (remember that oil is 100% fat; each T of any vegetable oil is 14g fat and 120 calories - so 3/4 cup has 168g fat and 1440 calories!). You can start with more oil or add it and quickly blend it in at the end. 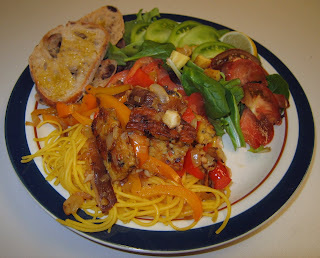 Tonight was the first real night of cooking in my six-week class; last week, was a quick "warmup" meal. 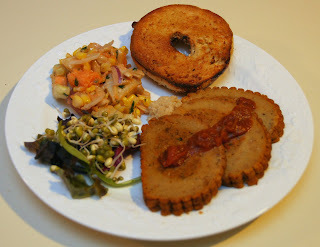 This is the finished plate of one of my students'; we made an eggplant saute with herbed tofu, tasty panzanella bread salad, orzo with herbs and lime zest, simple prepared polento heated with tomato sauce and served with nutritional yeast, and, not pictured here, the always-tasty blueberry crisp. We had time for a leisurely dinner - they did a good job getting done in a timely fashion and preparing a delicious meal. Tonight I cooked with broccolini, a cross between broccoli and Chinese kale, and also known as asparation, tender stem, and baby broccoli. I soaked some rice noodles in very hot tap water for 5-10 minutes and started sauteeing a large shallot that I sliced into long thin pieces. A minute or so later, I added maybe 15 brown crimini mushrooms sliced into thirds. I let that cook for about 5-7 minutes, adding half of a jalapeno pepper cut into thin slices as well during that time, then added the broccolini. As it turned brighter green, I added the drained noodles, maybe two minutes later. I put in a little soy sauce, stirred, and served a minute or two later. I also served tomato, avocado, and some soaked lentils. 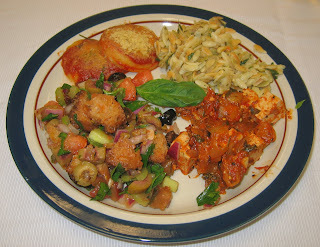 Tomorrow is cooking class; my students will be making delicious Italian dishes, including panzanella, bread salad. My parents are having a dinner party on Friday, and my wife and I are likely eating with them. My wife had to travel an hour and a half or so away for work today and met a friend for dinner. So I was on my own. We reached over 400 registrants, our limit, for our Thanksgiving so I had some scrambling to do and met with the restaurant, hoping to have evening seatings - but the chef needs more time to plan for evening details, so while we'll probably offer day and evening seating next year, we won't this year. We worked out another seating that will allow a total of about 515 to attend. Anyway, it ended up being fairly late by the time I worked out the new details for our webmaster and the website, returned calls from folks wanting to get in to the event, etc., so a quick dinner was called for. 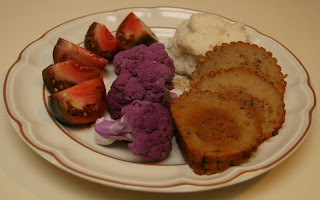 I had a little Field Roast "Grain Meat" Company's handmade vegan stuffed Celebration Roast left, and served it, heated, with mashed potatoes. 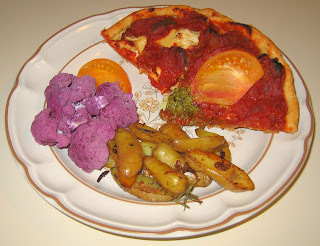 I also had some purple cauliflower that I had purchased, and served it with heirloom tomato slices. Yesterday, I gave a PCRM talk about heart health for a local Kiwanis service club; it went well (you can hear it on a podcast)! My wife and I had some errands and ended up shopping at Whole Foods. I had planned on cooking, but it was becoming late, so we enjoyed eating from the salad bar at the store. We were going to go grocery shopping today, but I looked at my "supplies" and decided that we could wait. I had some corn that I wanted to use up - I was originally going to make another "three sisters" creation like I did on October 30 and (yummy!) 28, but today just prepared it as I usually do, grilled on the open flame of my gas burner, stripped, and mixed with vegan Earth Balance margarine, salt, and (today I made it very lime-y by using about a fifth of a lime for the three ears of corn) fresh lime juice. 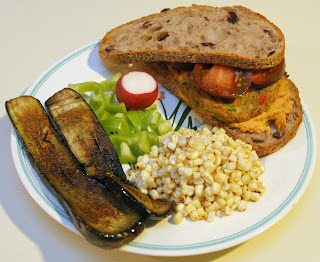 For the main course, I heated Dr. Praeger's California Veggie Burgers and served them, with purchased roasted red pepper hummus, on a nice olive bread. I also grilled thin 1/4" or so slices of eggplant and sprinkled salt and jerk seasoning on top, pressing the seasoning in a bit. I also had some Anaheim peppers and radish. It's been a few days since I cooked. Friday was the holiday Divali; my wife and I had a fun evening with my parents at their home and enjoyed delicious Indian dishes that she made including eggplant, potato, dhal (lentil soup), rice, and more. Yesterday, we had a very interesting potluck and talk on animal kinesiology; we just picked up bread, hummus, and lemon sorbet - the other guests brought great dishes, including the host, who prepared a so-tasty rice pasta dish with peanut butter and coconut milk! Coincidentally, just a few days ago I purchased the same brand rice pasta, and look forward to cooking with it - I loved its consistency at the potluck. Repeating what I had mentioned last July, "Tonight was the first of six nights ([Thursdays]..., skipping [Thanksgiving] ... and ending on ... [December 20]) of the vegan cooking class that I teach. This is the cooking of my students - today was mostly lecture and getting to know each other, and they had about 45m to put together this dish named after a friend's visits.I had a friend at Brown University in graduate school who would go to work on boats for weeks at a time and come back at indeterminate times for just a few days. Rather than pay rent, she stored her items at my place and stayed over the few days when she was in town. Hospitality is important to me, and I would prepare dinner for her when she arrived - including, as I recall, at 3 in the morning at least once. So what do you do when a hungry friend shows up at your home at 3 a.m.?My answer is tonight's dinner. 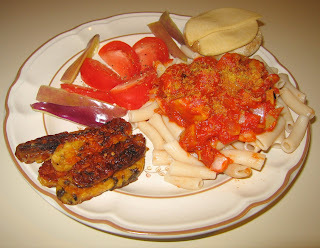 You make a quick saute of tempeh, shiitake mushrooms, and onions, and serve it over pasta with salad and bread/toast." I love to teach and am so fortunate that I get very nice and interesting students. It looks like we'll have fun over the six classes. 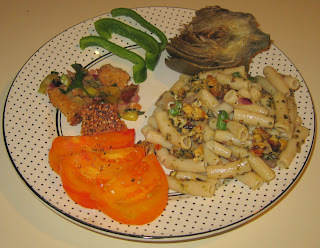 For tonight, we used a nice quinoa pasta. I am working on this year's Thanksgiving raffle and contacted the company that makes the vegan Field Roast handmade stuffed (with apples, squash, and mushrooms) Celebration Roast to see if we can promote their products. They have some new products that they want me to try and are sending me some for my own use - including a new kind of roast that has cranberries within it! I thought that I better use up the one roast that I had, so served it simply by heating (for maybe 10-15 minutes in a toaster oven at 350°F) and slicing it and topping it with salsa and having horseradish, which added a unique "pizazz", on the side. I had purchased a Caribbean sweet potato salad and served it too, as well as a bagel and small salad. 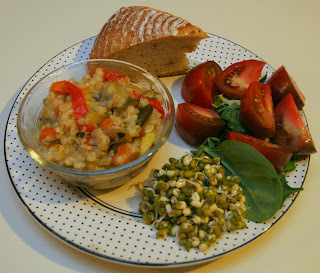 I took my leftover leek-barley vegetable "stew" from the day before yesterday and totally reworked it into a new dish where my wife couldn't tell what it was till she looked carefully and saw the barley. I used a prepared frozen spelt pie shell and filled it about halfway with most of the leftover stew. I added some marinated artichoke hearts and roasted tomatoes, as well as a little bit of tomato sauce (perhaps a half dozen dabs here and there of Newman's Own Sockarooni Sauce) and thin slices of eggplant that I had grilled for a few minutes in a little olive oil in a cast iron pan. I preheated my oven to 400°F and baked the pie for approximately 22 minutes, then served it with a little Eat in the Raw's Parma! vegan "Parmesan cheese" sprinkled on top. I recently discovered a product called a java rub from Keuka Lake Coffee Roasters in the Finger Lakes region of New York. I purchased their "mocha java mole" (Brazilian coffee, cocoa, and ancho chili powder) and gave it a try. I grilled some asparagus in a little bit of olive oil in a cast iron pan for just a few minutes. I transferred the spears to an oven-safe plate, sprinkled the rub on top, and put the plate into the 400° oven for 2 or 3 minutes to stay warm and get the flavor into the asparagus. Dinner was very good! 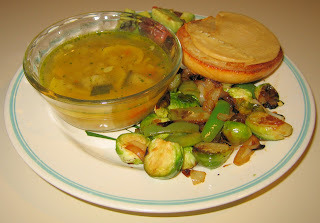 The few additions to the stew gave the pie a significantly different flavor that would not make one think "stew" or "soup". It was hearty - I only ate a sliver of a slice after the initial quarter on my wife's urging. The asparagus was quite good! The rub gave it a unique, earthy flavor. I am going to experiment with using the rub to create nice flavor tonalities, perhaps with tempeh or vegetables in a saute to caramelize the surface and keep the inside from drying out. I think it could work well to mix a little in to stews and soups, toss a little into a simple olive oil and garlic pasta, rub into thick slices of bread then drizzle with olive oil and broil, and to flavor rice. Here in North Carolina, we are starting to get some frost warnings - the weather was warm in the daytime but by the time I got out to vote in local elections when the sun was soon to set it was quite chilly. So I harvested my basil today and have two vases full of washed basil, ready to be made into pesto, and staying hydrated like cut flowers. I made a simple dinner tonight as I didn't have much time. I had to get dinner made early so I could go to a Latin American Film Festival at Duke University to see the film Laberintos de la Memoria (Labyrinths of Memory; about two interesting women seeking their unique roots - a Costa Rican woman born to Lithuanian and Ukranian holocaust survivors, and a Mexican adoptee who is now a Cuban academic) and enjoy questions/answers with the director Guita Schyfter. 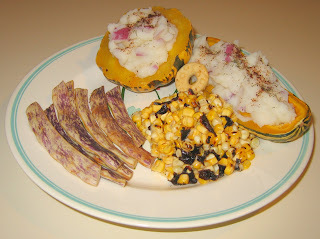 I simply baked delicata squash and ruby sweet potato in a preheated 375°F oven for about 35-45 minutes. I cut the squash in half and put it cut side down in an oven-safe plate that had a little water in it, and I also put the uncut sweet potatoes in the plate (the water keeps the squash moist). I served the sweet potato just with a little vegan Earth Balance margarine. 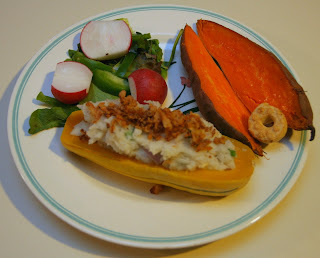 I stuffed the baked squash with some mashed potatoes that I had mixed shallots and bell pepper into, and sprinkled some Lars' Own crispy onions on top. It was a somewhat plain but tasty dinner. I'm attending an evening photography seminar from 5-9:30p tonight, so thought I'd get a meal going in the slow cooker. Around 1:30p, I started the slow cooker on low with two summer squashes cut into 1/4" discs and (for the thicker portions of the squash) half-discs; about a half dozen baby carrots cut into 1/4" pieces; a leek cut into half lengthwise (then washed thoroughly to remove any embedded dirt) then cut into 1/2" half-discs; a small 6-ounce container full of pearled barley and three times as much water; a vegan bouillon cube; a little salt; and fresh herbs from my garden - maybe a tablespoon of rosemary, a tablespoon of oregano, and a few teaspoons of sliced basil leaves. Let's see how it turns out 8 1/2 hours later! I'll serve it with some delicious hardy potato-onion bread that I purchased yesterday. We ate around 10:30p (mine was a good seminar by Hollywood veterans Bruce Dorn and Maura Dutra of iDC Photography and covered lighting, album design, and "painting" photographs). The "soup" had little liquid - I suspected that I needed more water than the amount the grain itself called for, but the slow cooker was full to the very top. I think I should call this a stew instead of a soup - and a very thick stew, at that. It was good but could have used a little more seasoning. At the farmer's market today, I found some nice sweet red peppers which I was able to use in tonight's meal. I chopped half of a medium sweet onion into approximately 1/4" or slightly larger cubes and began sauteeing them in a medium-high nonstick pan with extra virgin olive oil (I always use extra virgin when I cook with olive oil). Just two minutes or so later, I added three of the medium bell peppers that I had sliced into 1/4" thicknesses. A minute or two later, I added two small handfuls of shiitake mushrooms which I had cut into thirds or quarters. For the stems that were light colored, I included the whole stems, as well. I also put in an entire jalapeno pepper that I cut into 1/4" slices, as well as perhaps two teaspoonfuls of roughly chopped ginger. In the meantime, I had taken rice noodles and soaked them in very hot tap water for 5-10 minutes. 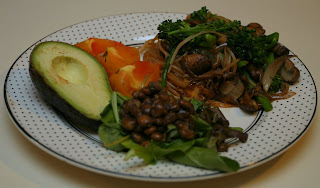 A few minutes after the mushrooms were added to the saute, I drained the noodles and added them, stir frying them. I put in a little salt but wanted to keep the flavor fresh and clean, so didn't add any sauces like soy. It came out great! I also just barely toasted some cranberry-walnut bread, and served it with peanut butter. Yesterday, my wife and I (for the second time) had the pleasure of seeing Pat Metheny (he played his amazing 42-string pikasso guitar in one early piece!) performing his lovely jazz in a trio with bassist Christian McBride and percussionist Antonio Sanchez. We went out afterwards to eat Lebanese food (falafel, hummus, tabouleh, ...) at a small family-run restaurant on Ninth Street near Duke University in Durham. Picking up from where I left off on Tuesday describing dinners that we enjoyed on our recent Southwest US trip, we left Bryce, drove through Capitol Reef National Park, and ended up in Moab, Utah for a few nights to enjoy Arches National Park. The first night there, Thursday the 18th, was our one bad dinner of the trip. Obviously from this blog, I am a "foodie" and value good food. Rarely have my wife and I had to suffer through a poor meal, but this turned out to be one of those very few times. We ate at a new Thai restaurant; the service was poor and the food was unappetizing. This was the first time in my life that I found rice that tasted bad, as if jasmine perfume were dumped in. The next night in Moab was much better. We ate at Eddie McStiff's, a microbrewery pub that at first didn't seem so inviting. But they knew vegan - we had a very nice waiter named Maggie who looked after us; she was vegan herself and treated us great! We had decent pizza and our first exposure to chili sauce which we found so commonly in New Mexico - they had one pizza with a chili sauce instead of tomato sauce (we didn't try it, but Maggie was kind enough to let us sample the sauce with chips - tasty!). In the store today, I was excited to find a nice quality frozen pizza shell that was vegan. On my layover on my way back from my recent Southwestern vacation, a friend and I enjoyed some good Chicago pizza, but the stuffed pizza had cheese in the dough. We had good thin crust vegan pizza, but the thought of deep dish pizza, famous in Chicago, stuck. Vicolo Pizza organic cornmeal crust pizza shell came in a pack of two and was perfect for a thick sauce. I normally like to make my own sauce, but started with a base of a small 6 ounce can of organic tomato paste and a new (at least to me) sauce, Newman's Own Sockarooni Sauce. I used half of the 24 ounce bottle of sauce; the sauce was reasonably thick but I thickened it further by mixing the paste in, as well as maybe ten small marinated artichoke hearts cut into quarters and several halved olives. I also mixed in a little salt and crushed red pepper, as well as maybe a dozen fresh oregano leaves. I grilled some thin eggplant slices till both sides were cooked, and used them to top the pizzas, also adding a roasted yellow pepper slice. I baked the two pizzas at 425°F for about 15m, turning them halfway through. A few weeks ago, I had a desire for onion rings and know of only one brand, Ian's, that makes vegan ones. I have not seen their Onion Rings and Strings in the store for a while, but found them today! I simply heated them and served them as a side. I made a simple dinner today; we had just come back from working out and delightful children were ringing the doorbell for Halloween treats. I cut a baking potato as well as about a quarter packet of tempeh into fingers. I began sauteeing the potato and a few minutes later added the tempeh. I took most (4/5?) of an organic sweet onion and cut it into thin half moons, which I added to the saute, along with perhaps a dozen halved asparagus spears, maybe 6-8 minutes after beginning with the potato. After an additional 5 minutes or so, I added maybe 6 tablespoons Baja Lime marinade, as well as a little bit each of salt, dried parsley flakes, and jerk seasoning. (I used up what I had left of the marinade; I should have used only half as much, but it turned out okay.) I served with a brown and wild rice mixture; it was a good meal.